In 1499 – seven years after Christopher Columbus landed in the Americas – Spanish explorers first encountered the land now bearing his name: Colombia*. With its high peaks and dense forest, this was an enchanting, deeply mysterious land. And no mystery would live on in European imaginations in quite the same way as the legend of El Dorado. The story tells of a man, a tribal leader of the Muisca people, whose initiation ritual involved his being covered head-to-foot in a fine gold dust. He would board a barge made of reeds along with a group of priests and tribal elders, which would float to the middle of Lake Guatavita – a place believed to be sacred – before he would dive into the lake and emerge from the water as the Muisca’s new ruler. The priests would take a number of symbolic objects made of gold on the barge with them, from which they would be thrown into the water by way of making offerings to their gods. Shortly after their arrival in South America, the Spanish conquistadors began hearing tales of this ritual, and of the ‘Golden one’. As the years went by and they encountered more and more indigenous people wearing large quantities of elaborate gold jewellery and ornamentation, the idea began to take hold that El Dorado might in fact be a place. Where else could a man covered in gold come from, but from a city of gold? A kingdom even, perhaps even an entire empire of unimaginable wealth. It was the belief in this mystical, ultimately non-existent location, and the lure of vast riches that went with it, that led generation after generation of explorers to attempt to track it down. Fransico Orellana’s hunt for El Dorado even led him, in the 1540s, to become the first European to navigate the entire length of the Amazon river. 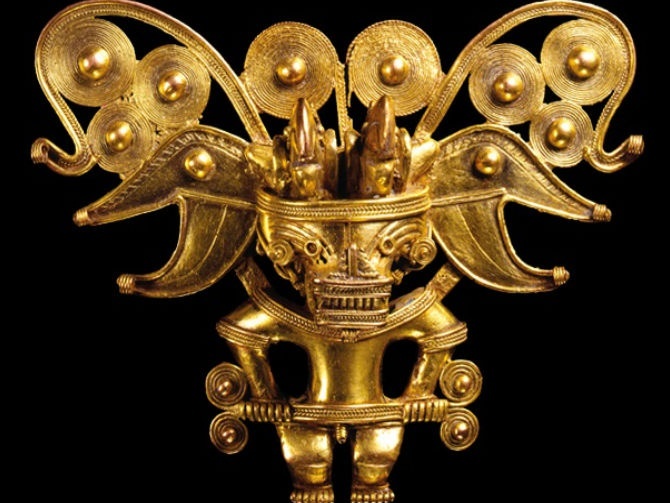 As its title suggests, the British Museum’s latest blockbuster exhibition Beyond El Dorado attempts to go beyond the myths and the legend that so obsessed European adventurers, and take a closer look at what actually lay behind it all: the indigenous people of Colombia, and their gold. Or more specifically, a collection of breathtaking gold objects, including jewellery, sculptures, helmets, tools and ornaments, spanning us much as 1500 years of human history. The exhibition asks: who made them, how were they made and what were they used for? As it turns out, it was not just the Muisca people who created these wondrous objects, but five other tribes who lived in Colombia before the Spanish conquest. As a timeline in the exhibition’s introduction illustrates, The Muisca were comparative latecomers (their society only emerging in around 600AD) compared to the Zenu, Tairona and Calima cultures that were already established in around the third century BC. The Quimbaya, meanwhile, came and went – the circumstances surrounding their disappearance unknown – between the 1st and 10th century AD, long before the Spanish even showed up. There may not have been a glittering city of gold like the Spanish had hoped – after all, each of these civilizations were composed of scattered, rural communities, who lived deep in the forests on the steep slopes of the northern Andes -but there was certainly a whole lot of gold kicking around these parts, along with highly skilled goldsmiths and goldworking. 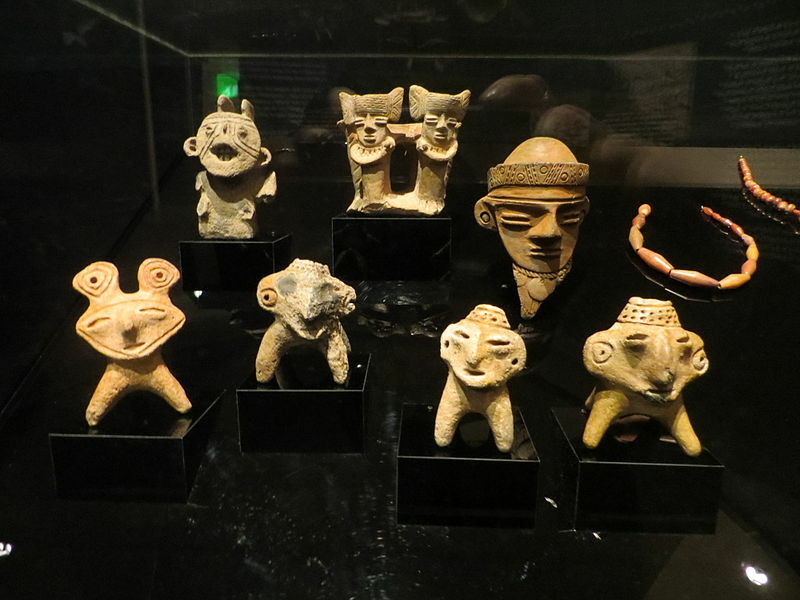 To give us an idea of just how powerful the myth of El Dorado was to the Europeans, and how long it lingered in the imagination, the exhibition starts with a collection of small ceramic objects, mostly human figures, recovered from Lake Guatavita. It turns out that these objects were purchased by the British Museum at an auction at Sotheby’s in 1910, a year after a British expedition had attempted to drain the lake and recover what they hoped would be an almighty hoard of gold. 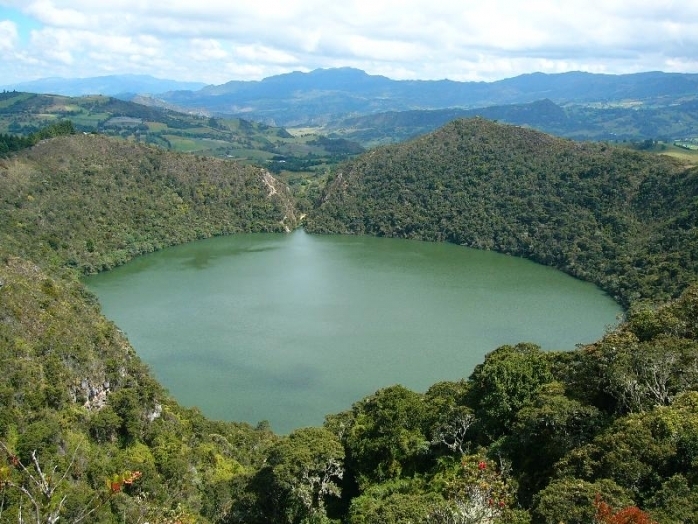 The Company for the Exploration of the Lagoon of Lake Guatavita succeeded in digging a tunnel that fed into the lake and reduced it to just four feet of mud, but the mud baked solid once exposed to the sun and made excavations practically impossible. The company’s loot made them just £500, and they filed for bankruptcy not long after. Four centuries after the Europeans had first been drawn to this place, and long after the last Muisca chief had dived into its waters, Lake Guatavita had once again refused to give up its secrets. Compared to what comes later in the rest of the exhibition, this cabinet of small ceramic curiosities is somewhat unimpressive, which I think serves as a nice parable about Europeans getting carried away with their greed. Or about naive humans thinking they can conquer nature, perhaps. Either way, the Colombian government eventually decided enough was enough and put an end to the gold rush once and for all. 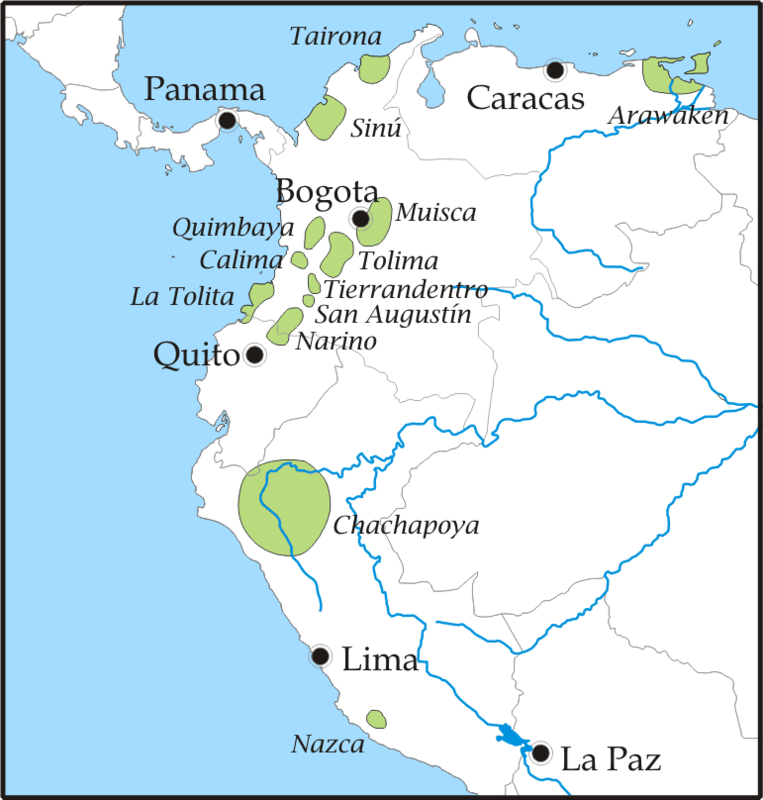 In 1965 Lake Guatava was declared a protected area. I had found myself wondering at the start of my way round this extraordinary collection of glittering and shining artefacts: did the Muisca, at Lake Guatavita, choose to offer their gods objects made of their most valuable commodity to make their offering appear as generous, or bountiful, as possible, to please their gods as much as they could? The more I read about them, the more I realised that these people’s relationship with gold was a little more complex than that. Certainly, decorating one’s self with gold to look good or show one’s status may not be too alien a concept for Europeans to understand, but the fact that it was not used a currency by the Muisca – or, indeed, any other of Colombia’s ancient cultures – suggest that its significance to the initiation ceremonies that took place on the lake lay in its symbolic qualities rather than any notion of pure and simple value. 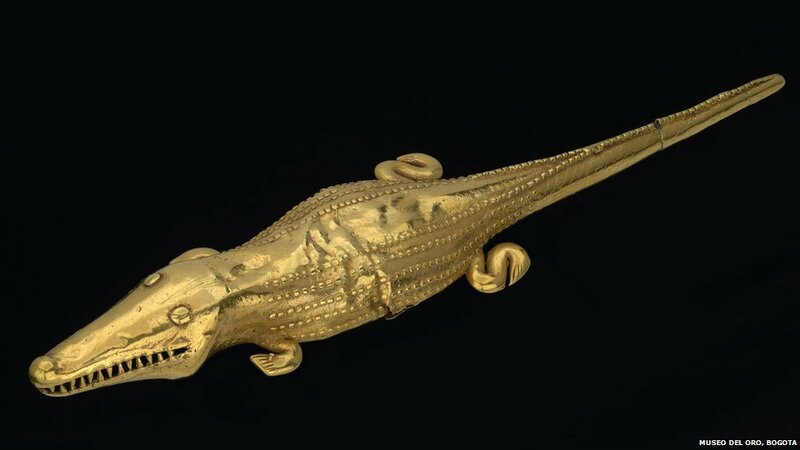 While to the conquistadors in the age of discovery, gold was a symbol of wealth and power, to the indigenous people of the northern Andes it was a symbol of light, life and vitality. Take, for instance, the many items of headwear on display. Some are masks, that cover the face, while others acted like hats or skull-caps to sit on the top of the wearer’s head. These would have reflected sunlight in a way that must have looked especially spectacular deep in the shaded, dimly-lit jungles and forests (nicely evoked by the exhibition’s perfect use of lighting and dark background colours). For the people who wore these pieces, by channelling sunlight down from the sky in this way, they believed they could harness the sun’s spiritual power. Many of the masks, earrings and nose ornaments – or, oversized moustaches – have bits of gold that hang or dangle, which were meant to rattle or shake during the dancing (one of the cabinets, containing body decorations made by the Calima-Malagana people, seems to have been placed beside a loose floorboard, which make its contents shake slightly as you approach it. Whether the curators deliberately placed it here I do not know, but my advice is to walk forcefully for maximum rattling effect). It is clear that within these cultures, the religious leaders (different from the actual leaders, or ‘secular’ rulers, interestingly) were looked upon as mediators between the human world and the spirit world, and that they had the ability to communicate with the spirit world. After donning their gold headgear, chest plates and other shiny regalia, and painting their bodies bright colours, these men would take hullosogenic substances derived from coca plants, and with a little help from energetic music and dancing, would enter a trance, where it was believed that their souls would temporarily enter the realm of the spirits. On display are a few finger-sized trays, for ingesting the coca through the nose, while next to them are some long, thick needles with decorative tips, that were used for dipping into a mixture of coca and lime which was then licked off the end. It seems even the drug-taking paraphernalia had to be made of gold. Many, if not most of the objects on display depict animals in some way. If not an explicit representation of a real animal – such as the spectacular Quimbaya crocodile, one of my favourite of all the objects here – then many of the masks feature bits of humans and animals mixed together, or abstract patterns meant to represent or evoke the spirit of a particular animal. I particularly liked the long-tailed monkey details on one of the earrings. Animal images were not simply decorative but were used to channel to spirit of a particular animal, or give the wearer of such images the traits or skills of that animal. It was believed that religious leaders could, during one of their hallucinations, inhabit the spirit of an animal, effectively becoming that animal for a short period. I would have liked to have seen more of an attempt to organise the objects according to the different tribes that made them, to help create a sense of each culture’s distinctive aesthetic or style. I think this would have been especially useful given the fact that gold is almost impossible to accurately date, and so there is no linear chronology to the objects (most of their accompanying blurbs say something like ‘c. 600-1300 A.D.’). At the start we are introduced to six distinctive groups, and told a little about which region they lived and when they lived there, but from that point on all of the objects from each culture are a bit of a mish-mash. Something I was grateful for was the section on how the objects were made, which certainly made it easier to appreciate the craftsmanship and artistry behind each of the objects. Whether you like to hammer your gold into flat shapes, or carve your design into wax and use it to create a clay mould, the techniques have change little over the centuries. It is thought that goldworking started in Colombia as far back as 1500BC. The gold itself was almost always mixed with copper, to create an alloy known as tumbaga, since in its pure form it was too soft to be of any practical value. Sometimes a mixture containing only 5% gold was enough to create the kind of beautiful colour and shine that was required. Even if it wasn’t worth as much to the Spanish once they got their hands on it. Of course, whatever the value of gold in a particular culture as a commodity or currency, these shining treasures are now more valuable than ever, thanks to the systematic destruction of the societies that made them. The Spanish took one look at the native peoples’ religious and ceremonial practices, and the all the symbols that went with them, and saw the work of the devil, and it is impossible to comprehend just how many works of art were destroyed or melted down. The fact that some of the styles and techniques of the cultures have been handed down to the many ethnic groups of modern Colombia – as many as 90 different groups in all – who can trace their ancestry back to the pre-Hispanic cultures is a small consolation, that we are reminded of at the end of the exhibition. Rosa Maria Jerez’s ceramic of the Virgin Mary and an infant Jesus apparently bears a slight resemblance to the Muisca junjos, in the shape of the faces and position of the arms. Though I couldn’t really tell, to be honest. I was very late on the scene with this exhibition, given that it opened back in October last year, but I am pleased to say that there is still time to catch it before the 300 objects on loan from Bogotá’s Gold Museum get flown back to Colombia. Beyond El Dorado runs at the British Museum until 23rd March 2014, with tickets costing £10. If, like me, you fancy visiting after work one day, go on a Friday, when the exhibition is open until 8pm. Tags: Andes, Beyond El Dorado, Beyond El Dorado exhibition, Beyond El Dorado review, British Museum, Calima-Malagana, ceramics, Christopher Columbus, coca, Colombia, colonisation, conquest, conquistidors, El Dorado, El Dorado exhibition, empire, exhibition reviews london, exhibitions london, explorers, Fransico Orellana, gold, goldsmiths, goldworking, hispanic, Lake Guatavita, Muisca, Museo del Oro, Quimbaya, Sotheby's, South America, Spain, tumbaga. Bookmark the permalink.